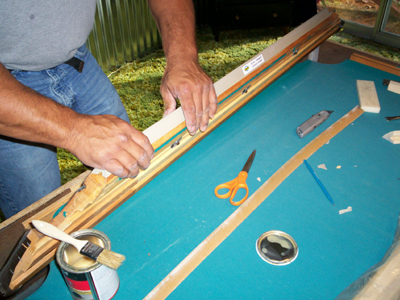 Now, with the new pool table cushion cut we are in the last stretch of this portion of the work. 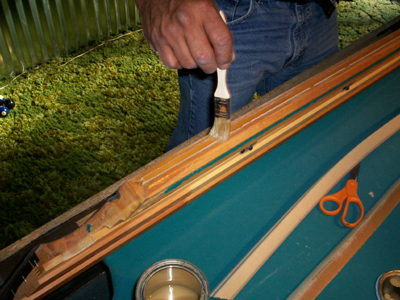 Spread a fair amount of contact cement (or felt adhesive) along the edge of the rail and the new pool table cushion. Wait a few minutes until the glue starts to turn a little white. Then place the new cushion in place. Pay attention and make sure that the corners are lined up properly and that you lay the new cushion even and as straight as possible with the top edge of the rail. Pool Table Cushion Replacement – Alignment… Press the pool table cushion down firmly, working back and forth along the rail, and working out any irregularities as you go. It needs to be as straight as possible. Pool Table Cushion Replacement – Corners… Here is the small black pocket protector. Just attach it with a fair amount of cement. 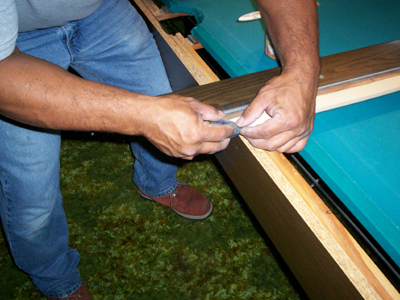 Be sure that corner is nice and pointy with no irregularities, or gaps.NOTE: when a professional recovers a pool table, the job is usually complete in one day. Even when it comes to pool table cushion replacement, those cushions (aka bumpers) are recovered after sitting for a short while.I strongly recommend that you allow the bumpers to sit overnight before recovering them so the new cushions, and the pocket protector are firmly attached, and dry so that they don’t shift when you recover them.